Leaks in your home or business can be costly–for you and for our community’s water supply. At Truckee Meadows Water Authority (TMWA), we encourage all of our customers to use the water they need, but please don’t waste it. 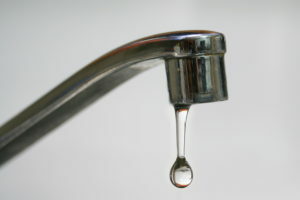 Leaks can be a huge water waster and may increase your water bill. A Donner Springs customer, who had a non-billing meter at the time, was losing between 800,000 and 900,000 gallons per month for approximately four months. The water was leaking from a yard line and the water never surfaced. The rate of the leak was approximately 20 gallons per minute. If this customer had been on a metered rate, the four water bills would have totaled more than $10,000, instead of $280 on the flat rate. TMWA conservation staff notified the customer, and the leak was fixed. Since this time, flat-rate metering has been phased out. Another story from before flat-rate meters were eliminated involved a customer whose non-billing meter at her home registered 300,000 gallons a month, compared to the average usage of 6,000 gallons a month for a family of four during the winter time. Again, the customer did not see puddles or running water anywhere. The leak was under a large deck in the backyard and was not immediately noticeable. TMWA recently documented a toilet leak at 19 gallons every five minutes, or 164,000 gallons in a month. Contrary to what some might think, it is entirely possible for a running toilet to lose that much, or significantly more. Another TMWA customer discovered a toilet leak of 144,000 gallons per month. Average inside water for a family of four is 6,000 gallons per month. That costs over $350 in unnecessary water usage charges for just one month. The amount of water used in your home or business is shown on your bill. The TMWA billing staff reviews bills for extraordinarily high water use and will attempt to notify the customer should we see it. Why does TMWA focus on Toilet leaks? Running toilets account for the vast majority of leaks found inside the home. While many people with toilet leaks don’t even realize they have a problem, it is estimated that about 20% of all toilets leak slightly. A toilet leaking one gallon every five minutes will cause the usage to jump by more than 8,500 gallons in a month—and you may never hear the water running. How do I check my toilet for leaks? To check for a leak, put a little food coloring in your toilet tank. If, without flushing, the coloring begins to appear in the bowl, you have a leak. To fix the leak, try replacing the flapper gasket, adjusting or replacing the flush valve, or call a plumber. The following instructions are for reading your meter to determine if you have a leak. Take care when lifting the box lid to prevent injury to yourself or damage to the meter or meter lid. Find your meter. In most newer homes it is located in the sidewalk in front of the house. Remove the meter box lid. Note: some meter box lids have a “flip lid” in the center. If so, open this instead of removing the entire lid. Lift the meter cap lid over the lens and position yourself to read the meter. Locate the dial on the meter face. This dial monitors water use in thousands of gallons. If the flow indicator or needle moves while all water devices inside and outside the home are shut off, water is flowing through the meter, indicating you have a leak. When you are finished, close the meter cap to prevent damage to the lens. Replace the meter box lid, taking care not to damage the meter or lid. How do I find a hidden leak? If your meter shows water flowing through it, yet all of your water faucets are turned off, you probably have a hidden leak. If you suspect you have a phantom water waster on your property, follow these tips to find the leak. First, make sure no water is being used inside or outside of your home. Then locating a leak is a process of elimination. Shut off one toilet at a time at the wall. The shut-off valve is usually located on or near the wall behind the toilet bowl. In between each shut off, go out to the water meter and check your flow indicator. If the small, red flow indicator is moving, that toilet is not the problem. Something else is causing the leak. If the flow indicator stopped moving, that means the toilet shut off is the culprit. Shut off the anti-siphon valve that serves your sprinkler system. Check the red flow indicator at the water meter. If the flow indicator stopped moving, the sprinkler system is the problem. First, you need to find your water shutoff valve. This is usually in your front yard near the sewer riser cap, in your garage or near your water softener unit. Shut off the valve, cutting off all water to your home, and go in the house and turn on a faucet to make sure the water is off. Check the red flow indicator at the meter. If it is moving, the leak is between the shut-off valve and the water meter. First, close the water meter cap to prevent damage to the lens and replace the meter box lid. If you are not able to find the leak, you should call a professional plumber to locate and fix the leak(s). If you find a simple leak like your toilet flapper or kitchen faucet, you may want to fix the problem yourself. The bottom line is that while TMWA is committed to helping every customer find the source of his or her water leak, it is not always easily identifiable. In these cases, a plumber or other industry professional may be best equipped to help. Periodically check all faucets for drips. Replace any worn and leaking washers, gaskets, pipes or defective fixtures. Also, check for leaks on outside faucets. Flushing a toilet can use up to seven gallons of water. Installing a low-flow toilet, which uses only 1.6 gallons per flush, can save up to five gallons per flush. The highest toilet leak documented by TMWA is 240,000 gallons in one month—that’s enough water to fill 75 construction water trucks, or more than 2.5 construction water trucks every day!